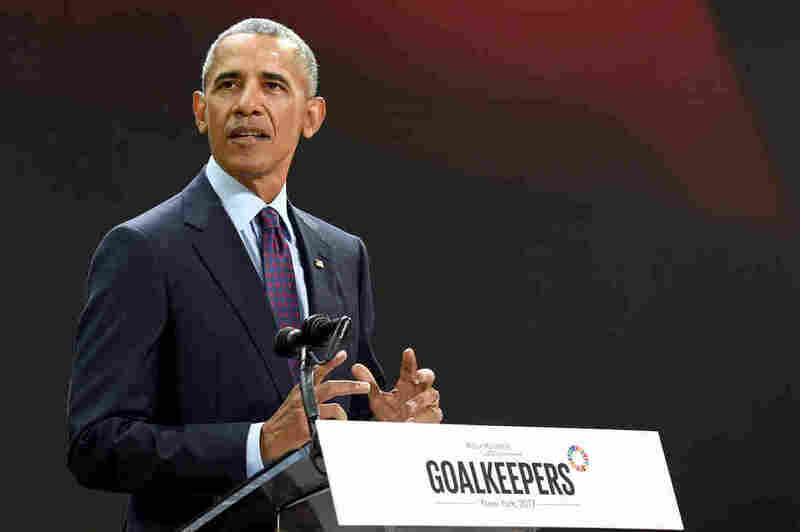 Former President Barack Obama Argues Against Dark Worldview, Defends Health Care Law "We have to reject the notion that we are suddenly gripped by forces that we cannot control," the former president said Wednesday, speaking in New York City while his successor was at the U.N.
Former President Barack Obama speaks Wednesday at the Goalkeepers 2017 conference, at New York City's Jazz at Lincoln Center. "You have to start with a premise and believe that multilateral institutions and efforts are important," Obama said, "and you don't have to cede all your sovereignty and it doesn't make you less patriotic to believe that. You just have to have some sense — and read." He also offered a vigorous defense of his signature health care law, the Affordable Care Act, or Obamacare, as Senate Republicans in Washington, D.C., try to corral the final votes needed to pass their latest effort to repeal and replace it. "It is aggravating," the former president said of watching yet another repeal effort, "and all of this being done without any ... rationale, it frustrates. And it is certainly frustrating to have to mobilize every couple of months to prevent our leaders from imposing real human suffering on our constituents." Though he did not name Trump during his speech and a question-and-answer session that followed, Obama argued against a dark and pessimistic world outlook. "We have to reject the notion that we are suddenly gripped by forces that we cannot control," Obama said at a Goalkeepers conference, a gathering of young, international activists sponsored by the Bill and Melinda Gates Foundation (which is among NPR's financial supporters). "[We've] got to embrace the longer and more optimistic view of history and the role that we play in it. And if you are skeptical of such optimism, I will say something that may sound controversial. ... By just about every measure, America is better and the world is better than it was 50 years ago, 30 years ago, or even 10 years ago. And I know that statement doesn't jibe with the steady stream of bad news and cynicism that we're fed through television and Twitter. But it's true. Think about it: I was born at a time, for example, when women and people of color were systematically excluded from big chunks of American life. ... Even if we still have miles to travel and innumerable laws and hearts and minds to change, the shift in what this country is and what it means is astonishing, remarkable and it's happened, when you measure it against the scope of human history [snaps fingers] in an instant." Obama argued that crime, teen birth, dropout, poverty and uninsured rates are all down; and that the share of those with college degrees is up, as are median incomes and life expectancies. He also contended that democratic and civil rights — like the right to vote and the right to marry — have expanded for women, ethnic and racial minorities and gays and lesbians. "All of this has happened in such a steady march that sometimes we have a tendency to take it for granted," Obama said. He added, "If you had to choose any moment in history in which to be born, and you didn't know in advance whether you're going to be male or female, what country you're going to be from, what your status was, you'd choose right now because the world has never been healthier or wealthier or better educated or in many ways more tolerant or less violent than it is today." That "Yes, we can" optimism stands in stark contrast to the nostalgia signified by Trump's "Make America Great Again" slogan. The current occupant of the White House rose to prominence and power by selling millions of Americans on a vision of America and the world now as dark and scary places. Part of how Trump did that was by channeling their cultural anxieties. Obama hat-tipped to that rising feeling of grievance as a critical problem in the world, describing it as "the rise of nationalism and xenophobia and a politics that says it's not 'we' but 'us and them,' a politics that threatens to turn people away from the kind of collective action that's always driven human progress."